Stylish sophistication takes the Connected smartwatch a long way, but only if the relative lack of tech-smarts doesn’t bother you. Smartwatches need to look good, and as luxury brands enter the market, we find they end up producing some of the best-looking wearables. One of the latest is the Emporio Armani Connected, Armani’s first Android Wear 2.0 smartwatch. It’s unquestionably attractive, with a name that oozes class, style, and sophistication. In our Emporio Armani Connected review, we see if the watch is all style and no substance, and if it is, whether it really matters. The reason you’ll buy the Emporio Armani Connected is because you like the way it looks. 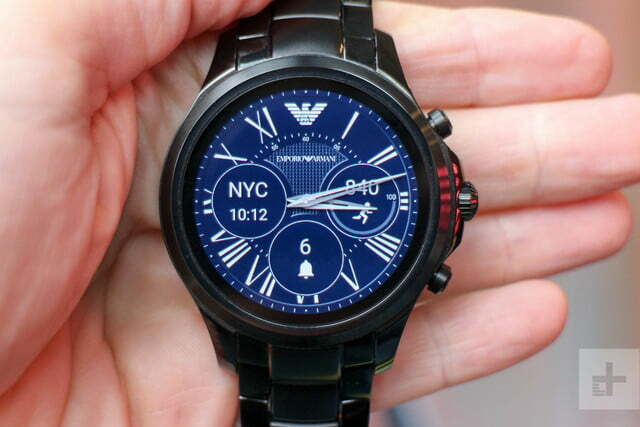 Smartwatches like this, and others from Diesel, Movado, and Fossil, are all technically identical. The differences are in the way the watch looks, the straps and bands, and the custom watch faces. It’s like shopping for a traditional timepiece from all these companies. You’re choosing the watch based on how it looks on your wrist, not how the tech enriches your life. Sound harsh? It’s really not. It’s the essence of how smartwatches should be. 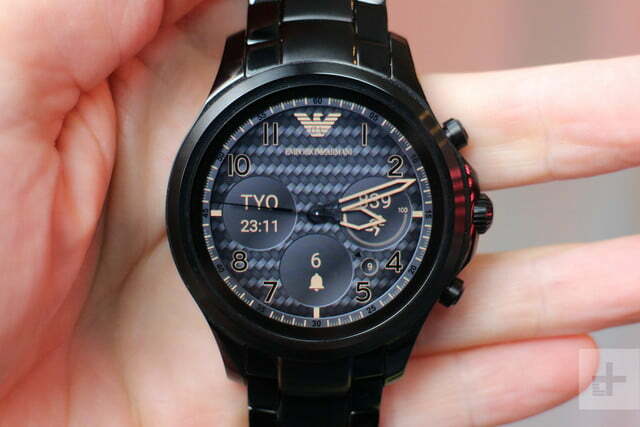 There are five different models of the Emporio Armani Connected, each made from slightly different materials, and with different strap designs. Our review model is (in our opinion) the best looking. It’s made from black-plated stainless steel, and the strap has a mixture of polished and matte links. Look closely at the crown and you’ll spot the Emporio Armani logo. It’s flanked by two secondary buttons to control the Android Wear operating system. 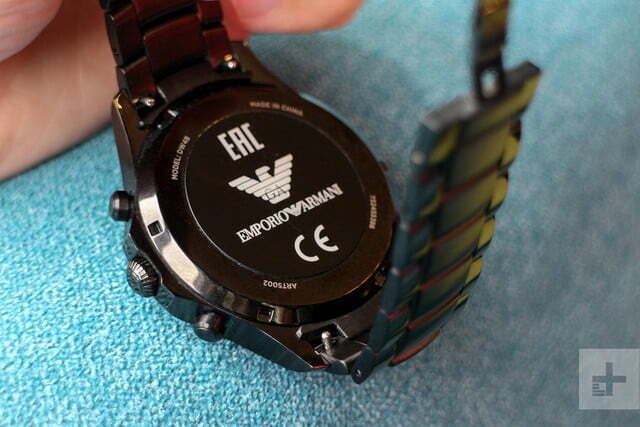 The Emporio Armani Connected is stealthy, smart, and surprisingly thin. Like the Diesel On Full Guard smartwatch, this is a new generation of Android Wear wearables, with a slimmer body that doesn’t sit so boldly on the wrist. It’s easier to wear with shirts, and looks more like a traditional analog watch, rather than a bulky piece of tech. 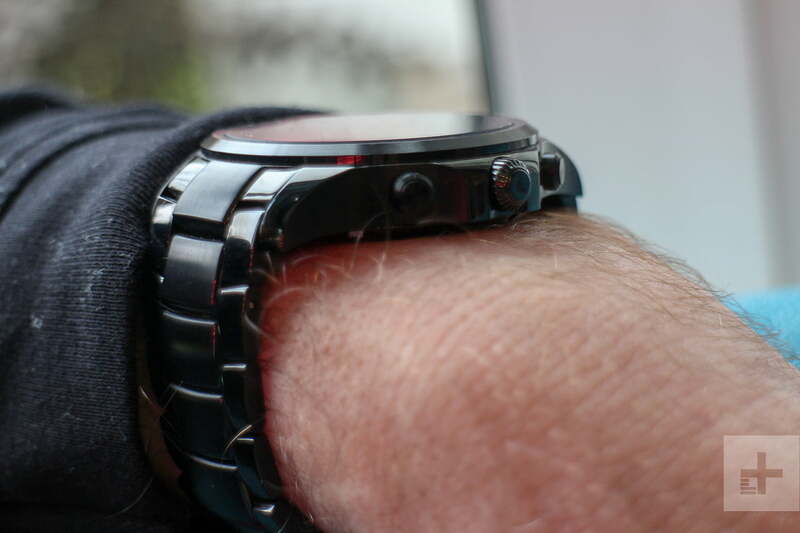 Our review model has a metal link strap, which did painfully catch wrist hair sometimes. Adjusting the size of the band can be done yourself with the right tools, or taken to a jeweller. If you don’t like the stealth black, there is a silver stainless steel version, a silver stainless steel and gold model, as well as two with leather straps and either a steel or gold body. The straps are also quick-release, so it’s easy to change the look, with Emporio Armani selling its own reasonably priced bands too. We rather like the rubber strap listed here. 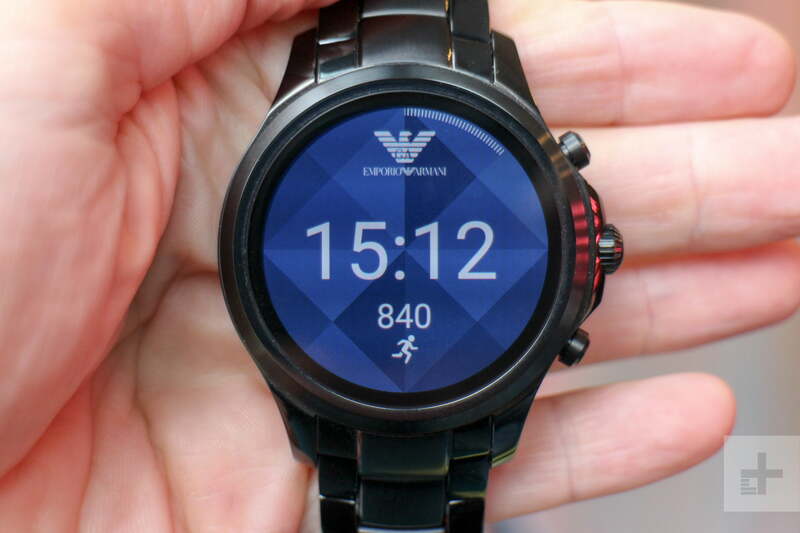 The Emporio Armani Connected is stealthy, smart, and surprisingly thin. The beauty of a smartwatch is you can change the watch face at a moment’s notice. 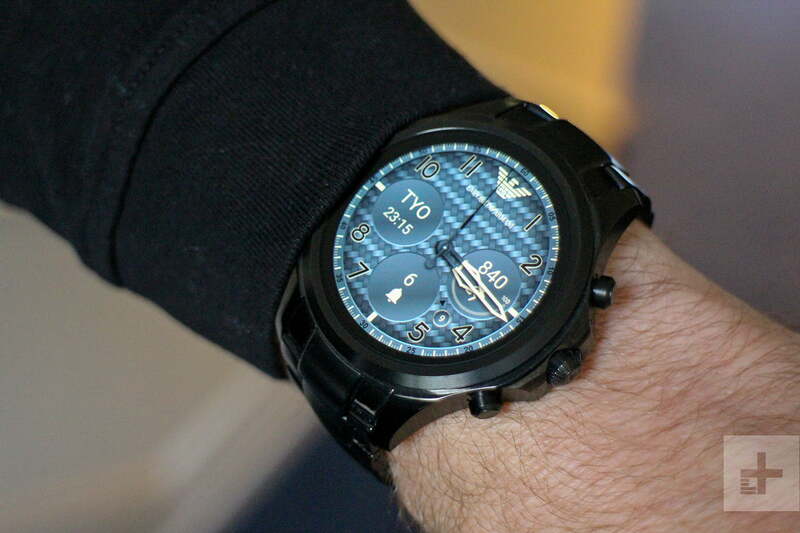 Armani has included several branded watch faces, which are highly customizable. Everything from the color of the hands, the background, the complications, and the digits can be switched to suit your own tastes. It’s easy to do, making it realistic to change the style to match what you’re wearing daily. That’s before you try out the hundreds of third-party watch faces available through Google Play. This is where Android Wear wins over the Apple Watch — you’re not restricted to a few official watch faces. The AMOLED screen isn’t too small: It’s bright, clear, and the always-on display — where a simple watch face is displayed to save battery — is legible even in sunlight. This isn’t a cheap watch, and it doesn’t feel like one. It’s understated, stylish, very well made, and light enough to wear every day. 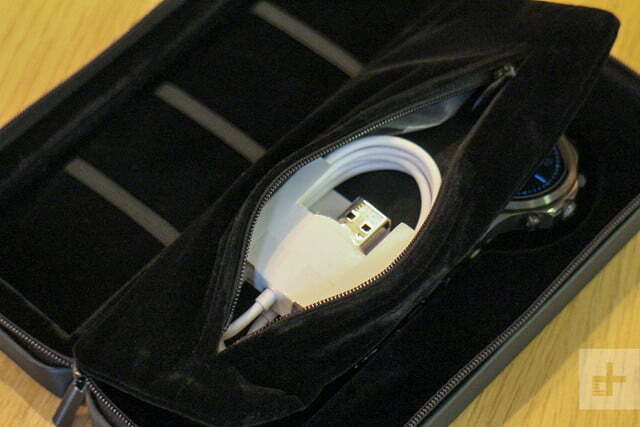 Its presentation is superb, right down to the cool travel case it comes in. Judged purely by design, it’s worth the investment; but what happens when we look closer? Android Wear is the wearable operating system from Google, and this year the company introduced version 2.0, which introduced many new and important features to the platform — from the Google Play Store and access to the Google Assistant, to a simplified design. Nearly all Android Wear 2.0 watches will feature the same software — the user interface isn’t different on each watch unlike Android phones. Manufacturers can, however, create micro apps that personalize the watch closer to the brand. Diesel has a micro app that acts like a special interactive home screen, and Michael Kors offers an Instagram-focused My Social app. The Emporio Armani Connected foregoes all that and sticks to the bare minimum — what you see is what you get. Android Wear 2.0 includes Google Assistant, which is called up by long pressing the crown. The Assistant uses voice control, meaning you have to get over any fears of talking to your watch in public. Like Assistant on your Android or iOS device, it’s effective and understands a growing number of natural, conversational phrases. The microphone doesn’t need to be right next to your mouth to pick up voices, but still struggles with noisy environments. Android Wear’s keyboard still frustrates because it’s a bit small, but at least you can swipe across it with your finger, or scribble letters to form a phrase. There’s also Smart Replies, which uses on-device machine learning to offer up short, contextually-relevant phrases you can quickly use in a conversation. Notifications are still a lengthy list without much categorization, but it’s better than it used to be in Android Wear 1.0. The Google Play Store is accessible in version 2.0, and there’s a reasonable amount of apps available for your smartwatch. It’s easy to use on the watch so it you are looking for an app, it’s not a nightmare, but it’s still just a long list of mediocre apps to scroll through. Android Wear (and wearables in general) work best with notifications, calendar access, navigation, and increasingly, music. Load music onto the watch, connect a pair of Bluetooth headphones, and you’ve got a convenient music player that’s ideal for workouts. The Google Play Music app is well designed, with large, easy-to-tap buttons. While controlling Android Wear is primarily done with the touchscreen, you can scroll through menus, messages, and lists by twisting the Connected’s crown. This is similar to the rotating crown on the LG Watch Sport and the Apple Watch. It’s very sensitive, so a gentle touch is required if you don’t want to go zipping through any menus at an incredible pace. What doesn’t the Connected have? This isn’t a wearable for the tech-lover; it’s a smartwatch for the fashion-lover. This isn’t a wearable for the tech-lover; it’s a smartwatch for the fashion-lover. It has no special features at all. It doesn’t have a heart rate sensor, so it’s not one for fitness fanatics; no GPS; and it doesn’t have an eSIM to enable voice calls and messages when untethered from your phone. It’s not modular like the latest Tag Heuer, and there isn’t a flashier model with a sapphire screen and more luxurious materials available, like the Apple Watch. It doesn’t have especially long battery life either, even without energy draining features like a heart rate monitor. If you turn the watch off each night, then you’ll just about get two working days from it. If you forget, then it won’t last through the second day. 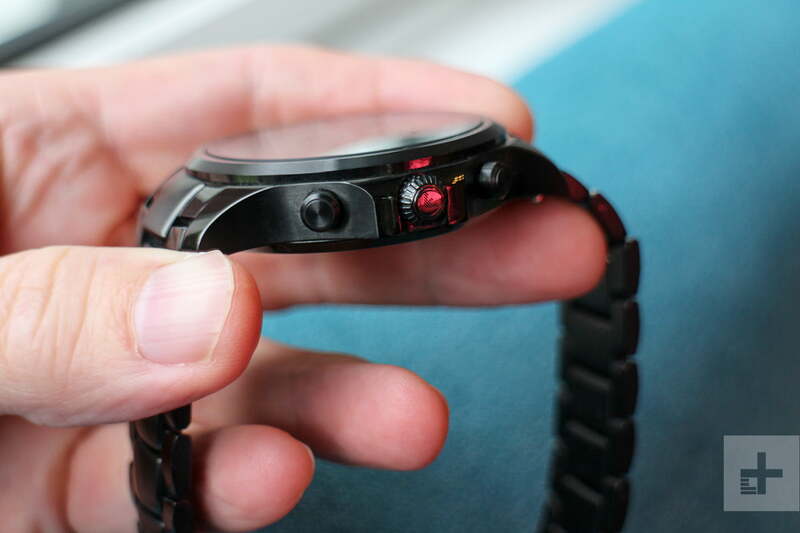 Charging takes an hour or so, and is performed by magnetically attaching the watch to a small charging tab. It’s small and easy to carry around, but not exactly luxurious. 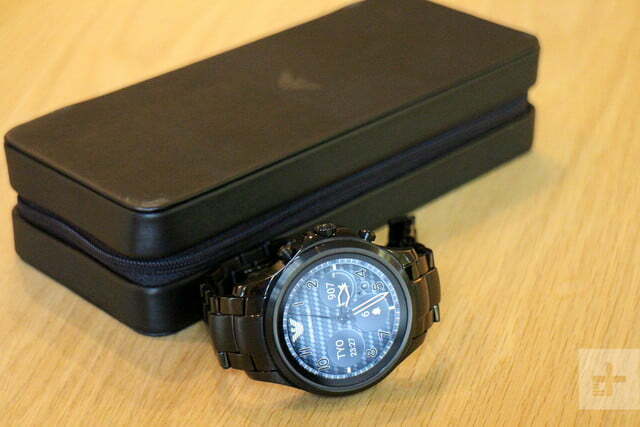 It’s also the same as you get with most other fashion smartwatches developed by the Fossil group. The final feature it doesn’t have is NFC, so the watch doesn’t have Android Pay. A Snapdragon Wear 2100 with 512MB of RAM powers the Connected, which has become the standard for most Android Wear 2.0 watches released over the past year. It’s not slow, but it’s hardly a rocket ship either, and there are pauses while apps or features load up. However, if all you’ve used is Android Wear 1.0, then it’ll feel like traveling in hyperspace by comparison. What it’s not is an Apple Watch Series 3, which is considerably faster, smoother, and more responsive. 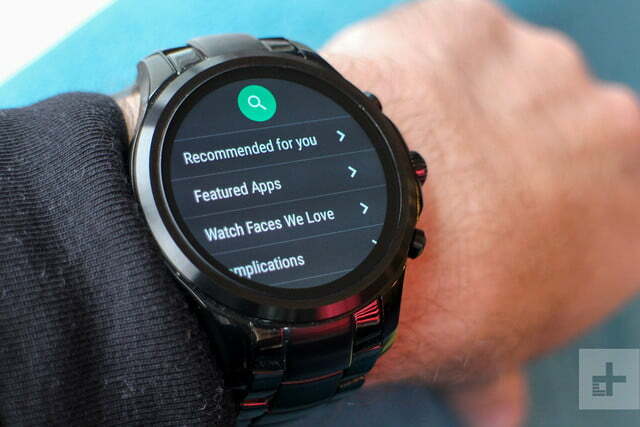 Android Wear is designed to work with Google’s Android mobile OS, and it connected to various smartphones without a problem. If you own an Apple iPhone, an Android Wear app is also available to download through the App Store, ready to link any Android Wear smartwatch to your phone. We had no trouble pairing the two, but there are fewer features available when the watch is used with an iPhone. For one thing, you’ll have to keep the Android Wear app running in the background on iOS. 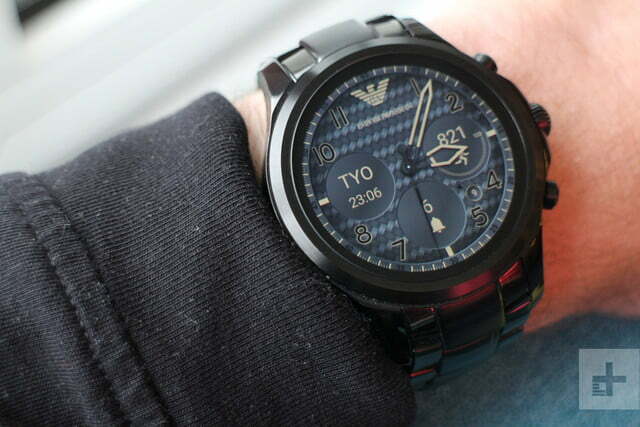 This is an Armani watch, and as we have already mentioned, it’s not cheap. The basic stainless steel model with a leather strap is $345, while the metal band models are $395. Additional straps from Armani range between $25 and $35. 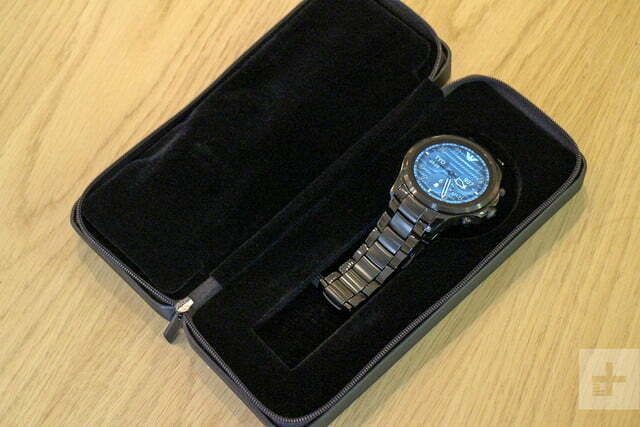 Our recommendation is to grab the stainless steel model in silver as a gift set. It costs $395, and comes with a black leather strap too. The straps have quick release fittings, so it can be swapped in moments. The Connected can be purchased through armani.com. The company offers a two-year warranty, where it will replace your unit if there are any manufacturing defects. Just like anything with the name Armani attached to it, wearing the Emporio Armani Connected smartwatch is about the way it makes you feel, and not what it actually does. Having a “bare essentials” feature list means the tech-smarts don’t overshadow the sophisticated style. Yes. If you have an iPhone, the Apple Watch Series 3 is better. If you own an Android phone, we need to clarify the meaning of better. If you want more features, the $300 Huawei Watch 2 and $350 LG Watch Sport both do more; but they don’t look as good. A better look comes down to personal preference. The $325 Diesel On Full Guard, the $350 Michael Kors Access Grayson and Sofie, and the $595 Movado Connect all have different looks. Not better necessarily, but maybe more to your individual taste. 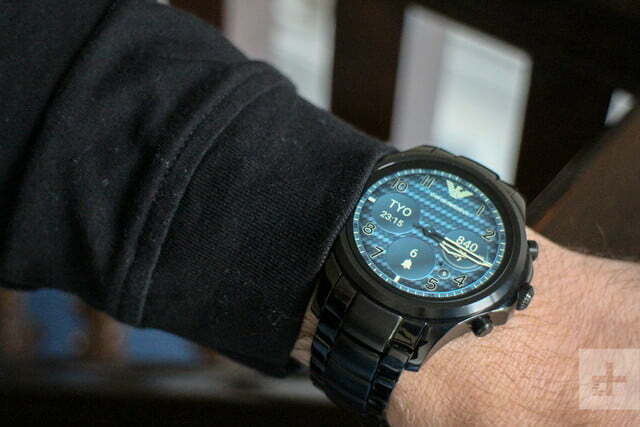 We also like the $295 Emporio Armani hybrid smartwatch, confusingly also referred to as the EA Connected. It doesn’t run Android Wear or have a touchscreen; but the style is fantastic, and it performs simple features like delivering notifications without any fuss. It’s also cheaper, and doesn’t require charging. There are two aspects of the Emporio Armani Connected that affect its lifetime: The battery and the software. The battery will inevitably lose its ability to hold a charge, but that shouldn’t happen for at least two years, and by that time, Google and Armani may stop sending the watch software updates. However, the watch will continue to work beyond this time. No specific water resistance level is given, so we’d suggest not showering with it on. Yes, there’s no reason not to if you like the look, and are partial to the Emporio Armani brand. We continue to wear the watch even though the review is complete, which says a lot about its attractiveness and comfort. It does everything we want from a smartwatch, without overloading with rarely used, energy-sucking features. It provides designer cool without the high prices attached to the slick, minimalist Movado Connect, or other big-name smartwatches from Montblanc and Tag Heuer.